The Red Sox plan to honor their basketball brethren before Friday’s game against the St. Louis Cardinals at Fenway Park. While no specific players are listed, the release indicated that the 2008 Celtics will be joined by team owners and alumni. 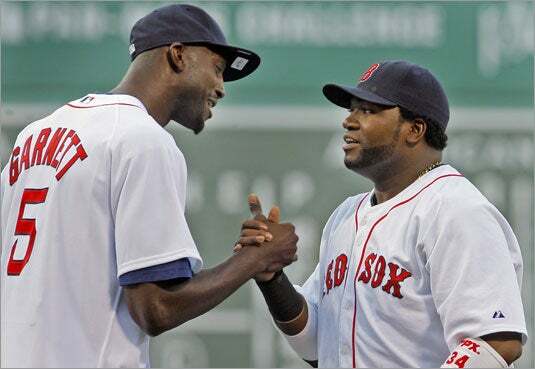 The Celtics and Red Sox have mingled many times over the past year, including when Kevin Garnett (above, with David Ortiz) and Ray Allen threw out ceremonial first pitches last season after being acquired by the Celtics via trades. Red Sox players and owners have been spotted at Celtics games throughout the season, including much of the Celtics’ run through the playoffs.